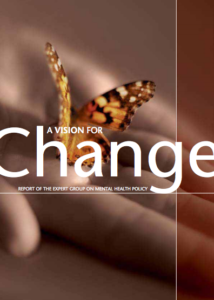 A Vision for Change proposes a framework for promoting mental health at all levels of society and for delivering specialist care to everyone who needs it. It recognises both the strengths and inadequacies of existing services and outlines a strategy for building on the innovations heralded by Planning for the Future. It details a series of actions for developing a comprehensive person-centred model of mental health service provision. The College of Psychiatrists of Ireland is very pleased to be involved in the ongoing review of Vision for Change. Please see a number of submissions below from 2009 – 2012 to learn more about our contribution to A Vision for Changes’ progress over the years.